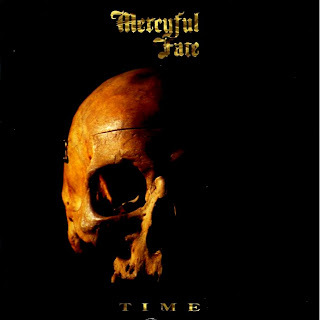 Danish black operatic metal masters Mercyful Fate return for their fourth studio album, and their second since the 1992 reunion. Time is an uneven effort, with a stream of upticks and downticks, but the album does contain some terrific moments that help to bolster the band's reputation. Opener Nightmare Be Thy Name is Mercyful Fate at their best, guitarists Sherman and Denner oozing intimidatingly menacing riffs all around King Diamond's blind-bat-from-hell vocals. If the gateways to the abyss have a theme song, Nightmare Be Thy Name would be a strong contender. Also excellent is the title track. Mercyful Fate can surprise themselves when they innovate, and Time slows down the tempo to remarkably good effect. Diamond's "minutes and seconds are passing us by" vocals are controlled and relatively hushed against a bloodcurdling theme appropriate for exploring the most haunted of evil mansions. Enter at your own risk. More forthright is My Demon, a galloping, high-energy track with all the Mercyful Fate ingredients lined up and polished to a shine. Less impressive are a trio of selections that just waste time: The Preacher moans along on a senseless path to nowhere; Mirror is a succession of chords that refuse to get acquainted; and Castillo Del Mortes is a mess of track that takes more than six minutes to arrive at nowheresville. Sharlee D'Angelo, later to join Arch Enemy, is a welcome addition on the bass, and overall the band sounds tight, although the dominant sound of King Diamond on vocals does, as usual, get overbearing. Time may pass, but some things just stay the same. Produced by King Diamond and Tim Kimsey. Mixed by King Diamond, Tim Kimsey and Hank Sherman. Engineered by Tim Kimsey. Mastered by Eddy Schreyer.